While all airmovers move air, the way they direct the air determines their best application. This is especially true in cleaning and restoration environments, where efficient drying is critical. Velocity. Rated in feet per second or MPH, velocity is critical to supporting quick evaporation from materials that are wet on the surface and/or highly saturated with water. When velocity is lower, drying effectiveness is reduced. Volume. Rated in cubic feet per minute, CFM is a measurement of the volume of air moving across a surface or through a drying environment. When the amount of air dispersed to the affected surface area is reduced, it impacts drying progress. Applications for drying large surface areas like carpets or walls or for ventilation will call for airmovers with larger CFM ratings. Pressure. Rated in inches of lift, usually stated in inches of water, but you might see inches of mercury. Higher pressures are needed to "push" dry air under carpets and into tightly built spaces like walls, cabinet bases and stairway assemblies. 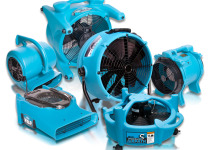 Airmovers that are ideal for hardwood floor drying or cavity drying will have high static pressure but lower CFM. Bottom line? Be sure you use the right airmover for the job.